One of the most enigmatic figures in literature is Helen of Troy, who almost certainly never lived but who has become one of the greatest icons of beauty, with her cascading and curled blonde hair. Over the centuries, her story has been told and re-told many times from the ancient world to the present day. On April 20th, Laurie Maguire, Professor of English Literature at Magdalen College, Oxford, took us on an epic voyage into the literary representations of a woman who has exerted an enormous influence on Western cultural awareness for more than 3,000 years. Laurie's talk followed the most beautiful woman in the world from the time of the Greek epic poet, Homer, to her depiction in Hollywood. She delved into the diverse variety of her image, spanning drama, novels, poems, film, comedy, and opera - including works by Euripides, Chaucer, Shakespeare and Christopher Marlowe. Since historians can find no trace of the real Helen of Troy on an ancient stone, coin or in a factual document, the quest for her is often directed towards dreams and fantasies. Laurie has found signs of Helen everywhere - beyond the poems and plays in which she is a character, and she emerges as the embodiment of absolute beauty. In her fascinating examination, Laurie considered what was meant by Helen’s beauty, what her history showed - and what implications her story has had for women at different times. Her talk ranged from Homer's Iliad to Derek Walcott’s epic poem Omeros, in which Helen is a servant in the house of Major and Mrs Plunkett, colonials in the Caribbean. This version of Helen wears a yellow dress which she has either been given by her mistress or stolen from her - a dress whose colour recalls the golden robes worn by the divine Helen of Troy, woven for her by her mother, Leda. Laurie described various manifestations of Helen on stage and film, including the first naked performance by Maggie Wright in an RSC production of Marlowe’s Dr Faustus (seen chastely from the back), in which he speaks the much-quoted lines: "Is this the face that launched a thousand ships?". Ever since Mephistopheles deluded Faust into believing that Helen of Troy stood before him - and would make him immortal with a kiss - there has been something elusive about her. Laurie suggested that It has often been women - and not men - who have most carefully examined the features of such beautiful women (for example, Elizabeth Taylor’s Cleopatra, or Hollywood’s choices for the part of Helen). Rossana Podestà, who appeared in the 1956 Cinemascope spectacular, had platinum curls, and played Helen as an undemonstrative ice-maiden and the film is packed with carnage. The words that appeared before the titles proclaimed that "her name was burned into the pages of history" and Helen’s name is flashed up and literally bursts into flames, continuing to burn as the ships, towers and walls of Troy came into view behind her, emphasising her iconic place in history. It was a rarefied evening in Wootton and over 100 people listened intently to Laurie's talk, which included a wide range of illustrations, including the intriguing blank page from Laurence Sterne's Tristram Shandy. Helen of Troy enters Sterne's work by association - Widow Wadman is a sexually predatory female, who is associated with Helen from early in the novel. When he comes to describe the widow's elusive beauty, Sterne leaves a blank page and asks the reader to "paint her in your own hand". References to Helen of Troy in Shakespeare's Troilus and Cressida were also highlighted. To mention The Bard was particularly appropriate because Laurie's talk coincided with the publication of an article in the latest edition of the Times Literary Supplement, in which she and a colleague suggested a collaboration between Shakespare and Thomas Middleton in writing All's Well That Ends Well - which had led to the world's press bombarding her with calls. 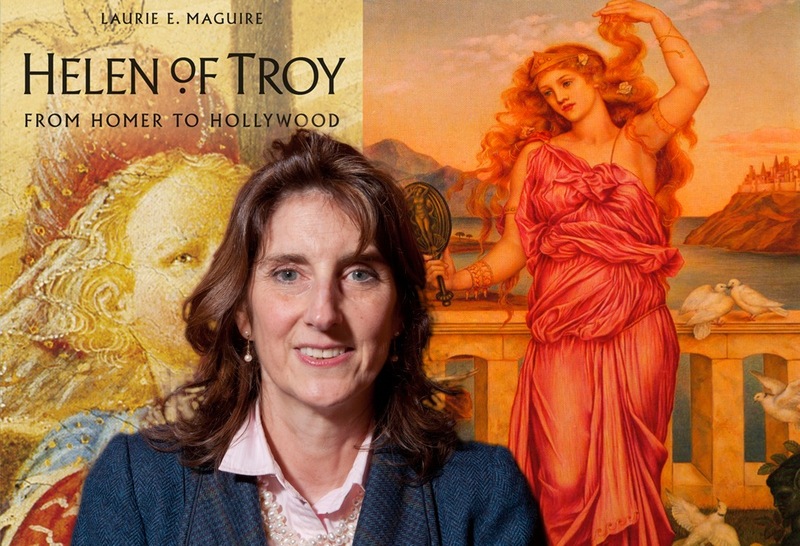 "Laurie Maguire's examination of the many aspects of Helen of Troy was a sheer joy. There are many complex strands to her story but she told it in clear and precise terms, taking care not to go over the heads of the non-specialists present. It was one of those evenings where you came away far more informed than before - and yet it never felt like doing homework, as such lectures often can be. You haven't repeated a theme to a talk in nearly four years - and this was one of the most fascinating" - Kevin Richards, Witney.